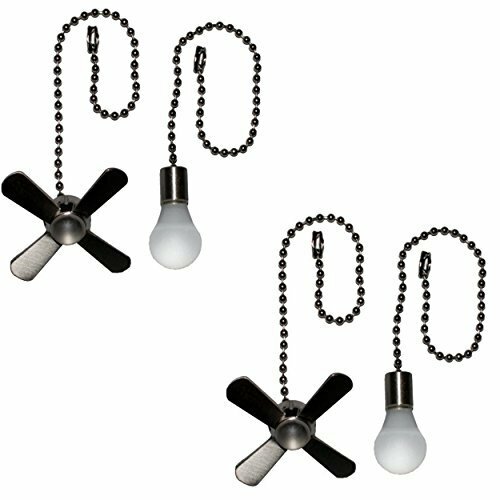 Not all ceiling fans operate by remote – sometimes, fans operate by pullchain. Pullchains are like they sound, a chain to pull on that operates the fan. The pullchain generally will activate the fan on the first speed, and then pulling it again would operate second speed, or reverse, etc. There may be multiple pull chains as well. Pull chains are useful in the event that the remote stops working. Some people swear by pull chains, because if you use them properly, you never have to troubleshoot remotes. The only disadvantage is, well – pullchains of course aren’t as convenient as a remote. If your Harbor Breeze fan has a short pullchain, it can be hard to reach. Ultimately, pullchains aren’t as convenient as a remote. A remote can stop working; a pullchain can also snap off the fan if you pull too hard – so be careful not to let it hang too low, as the kids or even the dog or cat could potentially damage the pullchain if it does hang too low. Also, if it’s low people could just walk right into it – it does happen! These aren’t usual problems people have with pullchains though, mind you. Pullchains are a good backup method if and when the remote fails. If you have a super old fan, it’s also possible the receiver may no longer be working on the fan – this happens too. If so, a pullchain can certainly be a viable option. You may not want to replace the remote or the receiver; the pullchain is more difficult for it to fail. If you need a replacement pullchain, we do have some available on this page.